On rare occasions, there are those moments when all elements come together in a breath. Only Henri Cartier's words can describe it best: "To take photographs means to recognize, simultaneously and within a fraction of a second, both the fact itself and the rigorous organization of visually perceived forms that give it meaning. It's putting one's head, one's eye and one's heart on the same axis." It was so, on the shores of la plage de Rivaz on the lake of Geneva, camera in hand as I was watching the boat to Montreaux take off. There out of the corner of my eye I saw a boy on the dock climb up on a post. My camera went up before my eye in what seemed to be an anticipated moment of unknowing. 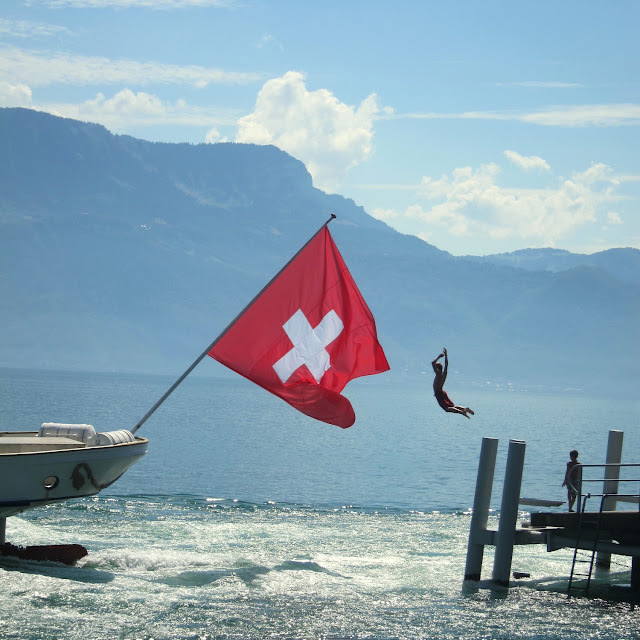 The boat's flag, his leap, my click - serendipitously united.